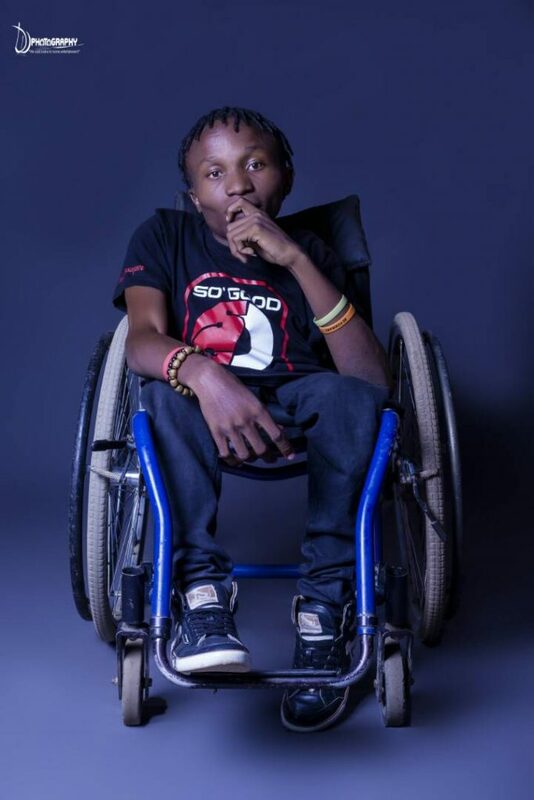 Zerub (Zerubbabel) Exodus is a Physically Challenged rapper, song writer, graphics designer, photographer, poet and fashion designer with a main focus on writing inspirational, conscious and motivational songs. Born from a family of 4 as Borniface Banda on the 13th of June 1993 and after deciding to entirely give his life to Christ in 2015 he later adopted the name Zerub (Zerubbabel) Exodus. Growing up, music was something that he was so acquainted with and he can’t clearly remember when he started doing it, all he knows is that he is not just a lover of music but a music artist too. 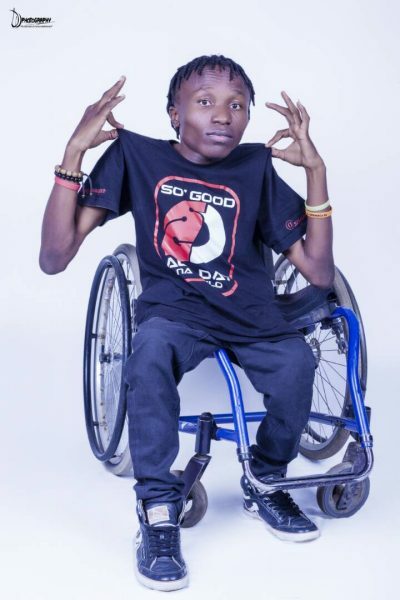 Despite him starting the journey of writing his own music when he was in the 4th grade at Da’gama Boarding School for the physically Challenged in Luanshya. Zerub had to first grow up and get to understand what rap music is all about before he could hit the studio. “My biggest inspiration in rap music has always been Tupac. I honestly feel him & i have some sort of connection especially in the type of content he wanted & I’ve always wanted to put out there. I know a lot of people have grown up knowing him as one who posed as a bad influence but there’s a brighter side of him that many have not come to know about, when he started up he wanted to use his voice to educate, & truth be told his music has really reached out to me & i plan to continue from where he left except with me there will be God engineering everything & not just one man army. and i did the secondary education at Kabulonga Boys High School in Lusaka.” – He said. He further appreciated Tupac as the only rapper with that kind of vision till today and his dream is to be part of the artistes doing rap music to educate, impact and bring change to the society, also boosting his aim of doing real music that uplifts & relates with people – whenever someone pass through fire, he wants to let them know that they’re not alone he’s also walking the same road. He also has an admiration for other rappers besides Tupac, e.g Eminem & J. Cole that made him feel like he has people who understood him whenever he was going through hell and it’s for that reason he wants to do music that does not only connects but also relates with people like it always was with him. “So all in all, i’m here for the, bruised, broken & all those hurting that need someone to walk with them through these rough phases of life. I’m not God but i have experienced a lot of pain & i know just how much damage it does to ones soul. & so i just wanna help wherever & however i can.” – He said. He urges everyone to not give sympathy because of his condition, he would like to be treated like a normal human being in any way. “All my life I’ve always seen myself as one who will become great & not die an ordinary death but will leave a legacy behind, that God will use to inspire & motivate people. I have been demoralized a lot not just by some peoples treatment towards me but even by myself every time i looked at my stature, i would feel let down by God sometimes especially when i was young, even the way people would treat or look at me seemed like i am an alien or something, some would even allude me to someone sick, others would even give me money out of pity cause they perceive me as a beggar or something and so it would make me feel so bad, i would look at myself & feel like i’m not worth anything but luckily I’ve grown up from a home that never perceived me as i did or the world did. Though inside i struggled to love myself & accept my stature. But now i’m all grown up & even if i struggle sometimes but thanks to God it’s not as it used to be before, by his grace i’m ever learning to embrace my situation, love myself & understand that i’m as fully human as one who is not physically challenged yet with a defect but that doesn’t make any difference. For what makes Man a Man is not what’s on the outside but what’s on the inside. So my daily prayer to God is that he may use me for what he built me for & in this very state that in man’s eyes seems impossible. My vision is to challenge society’s perception towards physically challenged people and i wanna live to witness this.” – He said.